Psycho-Pass: The Movie (Japanese: 劇場版 サイコパス, Hepburn: Gekijō-ban Saiko Pasu) is a 2015 Japanese anime science fiction crime film by Production I.G and ran in over 100 theatres. It premiered in Japan on January 9, 2015. The plot involves the appearances of terrorists in Japan. It is directed by Naoyoshi Shiotani whereas the chief director is Katsuyuki Motohiro. Gen Urobuchi and Makoto Fukami contributed together as the film's writers. The film has been licensed by Funimation and had a limited theatrical release in the United States on March 15–16, 2016. In 2116, Akane Tsunemori leads Division One of the MWPSB—composed of her, Inspector Mika Shimotsuki and Enforcers Nobuchika Ginoza, Sho Hinakawa, Yayoi Kunizuka and Teppei Sugo—in an operation against foreign terrorists who have infiltrated Japan. A gunfight breaks out when the team intercepts the terrorists in a parking area, resulting in the deaths of several terrorists while the rest are captured. Back at the MWPSB headquarters, Chief Kasei orders Shimotsuki to have analyst Shion Karanomori conduct a "memory scoop" procedure on one of the men without Akane's knowledge. By the time she learns of this, the memory scoop has already been performed, recovering images of Akane's old colleague Shinya Kogami among the terrorists. After consulting Professor Joji Saiga for advice, Akane applies for and receives permission to travel to the Southeast Asia Union (or SEAUn), a superstate which has begun to import the Sibyl System technology from Japan. Akane is received at the SEAUn airport by a military procession under the supervision of Colonel Nicholas Wong. Wong explains to her that Dominators are not used in the country, and due to a lack of resources, latent criminals are instead fitted with collars that will deliver a lethal dose of poison if their Crime Coefficients elevate. Akane is then introduced to Chairman Han, SEAUn's leader. The next day, Akane accompanies Wong and his men on a military operation outside Shambala Float. During the battle, she spots Kogami on a monitor and heads out to confront him. However, when Wong's drones endanger her in an attempt to kill Kogami, they are forced to flee together. Wong thus declares Akane to be a terrorist as well. Kogami brings her to the base of the terrorists, who are freedom fighters striving to free their nation from Han's military dictatorship and the Sibyl System. Meanwhile, Wong contacts mercenary leader Desmond Rutaganda and hires his team to find both Akane and Kogami. That night, Kogami explains he suspects a much larger conspiracy is unfolding, due to Han's full alliance with Sibyl despite being a dictatorial ruler. He reveals to her that the terrorists who appeared in Japan were not sent by their movement, and acted with help from an unknown sponsor. Rutaganda and his mercenaries suddenly attack the camp, killing many of the resistance soldiers. Kogami manages to help Akane escape before he is captured, and Rutaganda elects not to pursue her. Back in Shambala Float, Akane is arrested by Wong and slated for deportation, but saved when Han arrives to overrule the colonel. She returns to her apartment and releases "pill bug" drones to allow Karanomori to hack the Sibyl drones in the area. Shortly afterward she is drugged by her personal assistant, who is being blackmailed by Wong. Akane awakens just in time to see Wong betray their deal and murder the assistant in cold blood, leading her to realize the same truth Karanomori has discovered: the Sibyl System in Shambala Float has been tampered with to ignore Wong and the rest of the city's military, allowing them to act with impunity despite being latent criminals with severely elevated Crime Coefficients. Meanwhile, Rutaganda has Kogami savagely beaten despite being fascinated by him, but refrains from killing him. Wong and his men bring Akane to a helipad, where Rutaganda's group arrives with Kogami via helicopter shortly thereafter. He reveals that he plans to have them both executed, then use the helicopter to stage their deaths as the fault of a Japanese terrorist as part of a false flag operation to increase his own military power. Prior to the execution, Rutaganda taunts them with the information that "Chairman Han" is actually a Japanese impostor, and the real Han has already been assassinated. Suddenly, the drones present turn on Wong's men and begin gunning them down, having been reset by Karanomori to accurately detect their Crime Coefficients. The rest of Division One arrives in a helicopter, and Ginoza hits Wong with a shot from a sniper rifle Dominator, killing him instantly. In the ensuing battle, all of Wong's men are killed, along with all of the mercenaries except Rutaganda himself. Kogami escapes to pursue Rutaganda, urging Akane to go after Han and discover the truth about the conspiracy. Akane teams with Ginoza to do so, while leaving the others behind to secure the helipad, though they split up afterwards. Kogami confronts and fights Rutaganda, but he is overwhelmed until Ginoza appears and assists him. Together, the former partners manage to kill Rutaganda. In Han's office, Han is criminally asymptomatic and a Sibyl android, much like Kasei. Sibyl reveals to Akane that they engineered the entire chain of events, creating a need for the system in SEAUn before manipulating Akane with information about Kogami via the terrorists to go there and ultimately uncover Wong's plans, thus allowing Sibyl to fully seize control of the country. Akane confronts the system through Han, demanding that they have Han resign and hold a free, fair election. The Sibyl System grants her wish. The next day, Han makes a televised statement, claiming that Wong's failed coup has caused him to rethink his government and announce that he will indeed resign so elections can be held. Leaving the security of Shambala Float and SEAUn in the hands of the remaining, uncorrupted military, Division One departs to return home to Japan. In a post-credits scene, Kogami watches a child soldier attempt to learn how to fire an assault rifle and overhears a radio broadcast revealing that Han is winning the election. The film concludes with a voiceover by Akane, promising that someday soon, the true value of the Sibyl System will be examined. In September 2013, it was announced in the official site of Noitamina that a second season of Psycho-Pass and a new-original theatrical film project was in development. The film was rated as R15+ due to its strong violence scenes including murder and human body's damage. On September 2014, the release date was announced for January 9, 2015 and would run over 100 theaters in Japan. A 30-second trailer streamed on Nico Nico Douga on September 5, 2013, showing Shinya, Akane and Ginoza. A 2-minutes trailer, the second promotional video for the film, was released on September 2013, containing footage from the original anime television series. On February, 2016, Funimation released a preview for the Dub version and announced that the film would run over 100 theaters in North America and Canada. The main idea brought by the staff was about Akane finding the renegade Kogami which was influenced by multiple films like Apocalypse Now and Saving Private Ryan. The non-romantical relationship between these two characters was found appealing by the staff due to trust both have on each other. Additionally, the setting was meant to show how a dystopia would be in the future without the Sybil System in other countries. As seen in the previous series, Akane's characterization was further changed in order to make her a person who fought on her own. In order to try to make the story more realistic, Shiotani decided to make the foreigners speak English in contrast to other movies where they instead speak Japanese. The theme song was performed by Ling Tosite Sigure. The film was released on Blu-ray and DVD in Japan on July 15, 2015. The film was released in Japan on January 9, 2015. The film was ranked #4 in its opening weekend, where it earned ¥136,899,100 yen from 93,164 admissions. It then grossed ¥247,582,300 (around US$2 million) from 171,545 admissions in four days. The film subsequently grossed the equivalent of over US$7 million (¥850 million) at box office, a very good result for a R15+-rated anime film. The film topped Japan's Blu-ray Sales chart where it sold 24,000 units in its first week. The film was well received by critics. 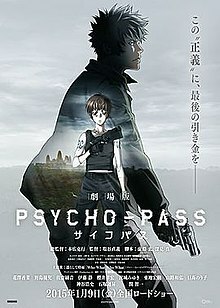 Jacob Chapman of Anime News Network gave the film an overall grade of B, saying that "Gen Urobuchi has unleashed all his most potent excesses back into the world of Psycho-Pass, for better and worse." He also noted that the second season has "no impact" on the film. He ended the review by stating "Chilling and occasionally thoughtful exploration of the Sibyl system's application to foreign policy, gratifying interactions between the lead characters, terrific fight scenes and production design, an engrossing and memorable adventure for the franchise." ^ "劇場版 PSYCHO-PASS サイコパス (2014)". allcinema (in Japanese). Retrieved March 24, 2016. ^ "Psycho-Pass: The Movie". IMDb. Retrieved January 21, 2017. ^ "Psycho-Pass: The Movie". Box Office Mojo. Retrieved January 21, 2017. ^ a b c "Psycho-Pass Film to Run in Over 100 Theaters". Anime News Network. October 10, 2014. Retrieved October 12, 2014. ^ "劇場版 PSYCHO-PASS サイコパス(2014)". allcinema (in Japanese). Stingray. Retrieved October 23, 2014. ^ a b "Psycho-Pass Film's Teaser Video Streamed". Anime News Network. October 9, 2014. Retrieved October 9, 2014. ^ "Psycho-Pass Film Slated for January 9 With Gen Urobuchi, Makoto Fukami". Anime News Network. September 26, 2014. Retrieved September 27, 2014. ^ "Psycho-Pass: The Movie: Funimation Films". Funimation Films. Retrieved March 7, 2016. ^ a b Funimation Films. "PSYCHO-PASS: The Movie : Funimation Films". funimationfilms.com. Retrieved 28 March 2016. ^ "Psycho-Pass Anime Gets New Film Along With 2nd Season". Anime News Networkaccessdate=January 20, 2017. ^ "Psycho-Pass Film Given R15+ Age Rating". Anime News Networkaccessdate=January 20, 2017. ^ "Eirin Gives "R15+" Rating on "PSYCHO-PASS" Film". Crunchyroll. Retrieved January 20, 2017. ^ "Psycho-Pass Film Slated for January 9 With Gen Urobuchi, Makoto Fukami". Anime News Network. Retrieved January 20, 2017. ^ "PSYCHO-PASS サイコパス』プロジェクト重大発表会に潜入捜査！". Nico Nico Douga. Retrieved January 20, 2017. ^ "Psycho-Pass 2nd Season, Film's Announcement Trailer Streamed". Anime News Network. Retrieved January 20, 2017. ^ "VIDEO: FUNimation Previews "Psycho-Pass - The Movie" Dub And Plans". Crunchyroll. Retrieved January 20, 2017. ^ "Funimation Announces Psycho-Pass Film's Theatrical Dates". Anime News Network. Retrieved January 20, 2017. ^ Psycho-Pass Official Profiling 2. Kadokawa Shoten. 2015. ISBN 978-4041027691. ^ Simons, Roxy (October 30, 2016). "Psycho-Pass Director Naoyoshi Shiotani INTERVIEW @ MCM London". Mym Buzz. Retrieved November 11, 2018. ^ "Ling Tosite Sigure Performs Psycho-Pass Film's Theme Song". Anime News Network. Retrieved January 20, 2017. ^ "『劇場版 PSYCHO-PASS サイコパス』Blu-ray&DVD 2015年7月15日(水)発売決定！". March 20, 2015. ^ ""PSYCHO-PASS" Film Earns 248 Million Yen in First Four Days". Crunchyroll. Retrieved January 20, 2017. ^ "Yo-kai Watch Film Tops 6.5 Billion Yen, Psycho-Pass Earns 248 Million". Anime News Network. Retrieved January 20, 2017. ^ "花澤香菜、大感激！劇場版『サイコパス』興収8.5億円突破！". cinematoday.jp. Retrieved January 20, 2017. ^ ""PSYCHO-PASS" Film Tops Japan's Weekly Blu-ray Sales Chart". Crunchyroll. Retrieved January 20, 2017. ^ "Psycho-Pass: The Movie". Anime News Network. Retrieved January 20, 2017. ^ "Fate/Stay Night, Psycho-Pass Film Win Top Newtype Awards". Anime News Network. October 10, 2015. Retrieved January 11, 2017. ^ "Empire of Corpses, Girls & Panzer, Psycho-Pass Nominated for Japan Sci-Fi Con's Seiun Awards". Anime News Network. March 29, 2016. Retrieved January 11, 2017. ^ "SUGOI JAPAN Award2016 voting results". Sugoi Japan Award. Retrieved January 11, 2017. This page was last edited on 21 March 2019, at 14:17 (UTC).